From Design............To Construction............To Family Time! Whether your house is built, or whether you are early in the design stages, the foundation to any good design is a detailed plot plan that shows the footprint of the house with finished floor elevations, easements, setbacks, utility locations, trees and obstructions or any other site contingencies. Once the site survey has been obtained from your architect, builder or county record, our designers can draft a preliminary sketch that considers the architecture of your home, rear elevation, your functional requirements, deck utilization, equipment specifications, sun & wind exposure, privacy and view requirements. NOTE: For hillside properties, it is often necessary to obtain topographical surveys and/or soils engineering prior to the design process. Perimeter & Retaining Walls are best designed in conjunction with the pool, not independently. Cool Water Pools & Spas, Inc. is available to meet upfront with your architect during the design phase of your home so that a fully integrated design can be realized. Operating within a specified budget or price range, our designers will draft a design for your review including several options and variations. Designs, along with a detailed cost estimate will be sent to you, or emailed in PDF format for your review. At such time, a follow up visit will be scheduled for design changes or to review Equipment Specs, Deck Options, Color Choices, etc. If Structural Engineering for the pool or Perimeter/Retaining Walls is required, the customer shall be notified at this point.. Depending on your county and municipality requirements and the complexity of your project, this phase could range from a few days up to several weeks. Cool Water Pools & Spas has a 48 hour turnaround for all submissions to County Permit & Engineering, however, delays due to county backlogs, multiple reviews and custom engineering requirements are not necessarily under the control of the builder. Checkpoint 1: The permitting phase is the best time to review your Customer 10-Point Checklist. This list will serve as an advisory and reminder as to what is to be expected of you during the construction process. Once the building permit has been obtained and posted, construction can begin. 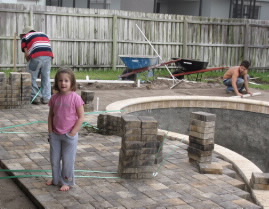 Some projects require a good deal of prep-work before the actual pool construction can start. Demolition, shrub & tree removal, sod pre-cut and removal, concrete removal, pre-grading, drainage and retaining walls are just a few of the items to be completed prior to layout. If your rear property and soil composition indicates a high moisture content we will often dig well-points to relieve sub-surface (hydrostatic) water pressure and to dry-out the site prior to digging. A small pump may run for a day or so in order to accomplish this task. Please do not un-plug these pumps during dry-out as this may delay the process! After the Pre-Grade, a Layout & Dig Crew will layout the shape of the pool using spray paint, stakes and the day prior to dig it is outlined with form boards. Checkpoint 2: Once the pool is either painted on the ground or staked and delineated with string line, this is a great time to meet with the project manager and designer to verify the actual size, configuration, placement, depth and height of all design features that were discussed during pre-sale design. This is where the vision of your project really begins to take form. If you haven’t experienced it already, the action and excitement begins with heavy machinery tearing into your site. 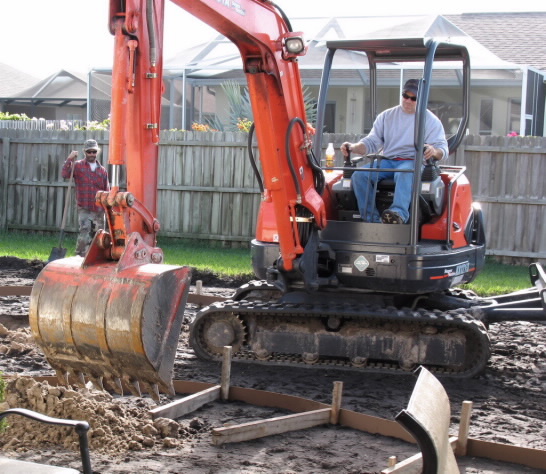 Small pools and spas are typically dug with a bobcat and most medium/large digs are done with a backhoe. Your pool's layout is normally to water's edge so it's necessary for your excavator to move his forms back at least 8” for the bond beam. For small pools a ramp may be utilized for the excavation. The standard rule is two feet out for every foot of excavation. So, if the pool is six feet deep, then the ramp would extend outside of the water's edge about twelve feet. This is important to keep in mind when considering underground utilities. For the majority of digs CWP&S will use a backhoe and a ramp will be unnecessary. Your excavator will dig out an eight inch by eight inch or twelve inch by twelve inch box beam pending on design and choice of coping. Three inches will be added to the excavated floor depth to compensate for the exposed portion of your pool tile. So, if your pool should finish 4'6", then a 4’9” depth to floor is allotted. Your digger will actually dig from 5’ to 6’ below the pool's wooden forms to allow for an 8” to 10” floor base. Your pool's steel is like your skeleton. Our pool steel design has been engineered to insure maximum strength. Your crew will tie a bond beam with #3 rebar (3/8") and the pool body will also be steeled with #3 rebar (3/8"), forming 12” squares on center. Steel overlaps will be tied at 18”. Structural Dam walls and Vanishing Edge walls will be reinforced at 6” on center utilizing Steel-Tex Mesh. Breakpoints on deeper pools will require alternate bars as well. Normally, steel is not required in steps and shallow benches. Deep water walkouts, deep water benches (5' +) and swim-outs/tanning ledges, however, will require steel. Objects such as bar stools that stand alone will also require steel. Your crew will leave deck dowels extending above the pool's form boards. These are for securing electrical bond wire and can be bent down after the concrete is shot to help support the deck. The Steel Crew will also pre-plumb the pool including all Drains, Skimmers, VAC lines, Returns, In Pool Water Features, Therapy Jets, In Floor Cleaning Heads, Lighting, etc. Checkpoint 3: At this time it is good to double check things such as light placements, therapy jet locations and In Floor Cleaning Head locations with your construction supervisor prior to the installation of shot-crete. Your pool is simply a circulation system. Water is pulled from the skimmer and main drain(s) to your pool pump's suction side and pushed through your pool's Filter, Heater (if installed) and returns by your pump's return side. Some of this return water may also go to waterfalls, water features, etc. For pool and spa combinations, it is not uncommon that an additional (1/2 hp) pump (with separate suction and return) be added to operate secondary water features, such as in-floor cleaning systems or multiple deck jets & waterfalls. A small feature pump will save energy when operating these features throughout the day. Your pool skimmer helps clean the top 3" of water by "skimming" the debris from the water's surface. Your drain helps with overall pool circulation and sanitation. Your pool may have a fill line for filling and/or an overflow line (if specified by the designer). This keeps them from adding too much water to the pool. You will see pipes extending from your pool skimmers during construction. These allow us to put the plumbing system under pressure to insure there are no leaks. The return pipes are stubbed past the concrete shell and capped during construction. These will be cut and fittings attached at plaster. A Word on Gas Heaters - Your heater may run off of electric, natural gas (NG) or liquid propane (LP). If you’ve purchased a NG or LP heater or Fire Feature, it must be hooked up to the source of this gas and run to your equipment. It is the customer’s responsibility to provide a gas stub-out at the equipment pad location as specified on your “Pool & Deck Layout” sheet (See also Customer Checklist). If your gas needs to be inspected, the gas company will put a gauge on the end of the line closest to the equipment. This will be removed after inspection. The gas company/provider will secure all connections to the heater and/or Fire Features. 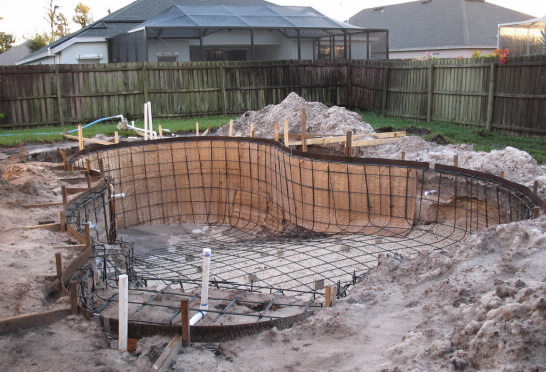 Watch, as your pool takes shape before your eyes! Your shell is shot with 4000 - 5000 PSI, “high-strength” fiber-mesh concrete. By code, your bond beam should finish at a minimum of 8” X 8" (maximum 12” X 12”), your walls between 6” - 8” and your floor at a minimum of 8" and maximum of 10”. Your steps (and normally benches) are solid concrete. No steel is needed unless these structures are located at a depth of 5' or more. You will notice muddy/brown ground water may fill into your pool from open drain plugs located in the bottom of and sometimes from the side drain of your pool after it has been shot. These are weep holes to prevent your pool from floating due to subsurface (hydrostatic) water pressure. Do not re-plug or drain your pool of this water! The same well-points placed during the initial dig may be re-utilized to pump-out sub-surface water as well to relieve this pressure. IF you don't see umbrella sleeves or volleyball cups, don't worry, we will install them prior to plaster. You should try to water down your concrete shell beginning the day after it is shot. This will insure that your concrete does not cure too fast. Once or twice a day should be sufficient just to get the surface wet. Please don't walk (or allow pets on) on freshly shot concrete ----- it may look hard but it's better to wait overnight. You will require electricity to run your pump, pool & spa lights, your heater and add-ons (i.e., Aqua-RiteÒ, Aqua-Logic ControlsÒ, X-10, etc.). The first step in this phase is trenching for the conduit. After the path is trenched, a gray conduit or pipe is laid. This conduit is a gray color so that everyone knows it's electric and avoids digging or cutting into it. This conduit may be run to a junction box in an effort to save you money on electrical. Your electrician will also run a bond wire from your steel rebar deck dowels, pool and or spa light, and any metal, including hand rails or ladders. Your electrician will then pull wires through the conduit and connect your equipment and lights to your breaker box. If your breaker box is inside your home or a locked garage, you will need to make yourself available to let the electrician inside. Your electrician will hook up a time clock (or Aqua-LogicÒ System) that will control your pump and filter operation. He will also provide a switch for your light. An outlet will also be provided at your equipment location which is a "ground fault interrupter". We will need between 25 and 60 amps for your equipment. If your service is full, then you may need a sub panel added (See also Customer Checklist). There may be an additional cost for this (not included in the contract) and your electrician will notify us if one is needed. Your pool and spa lights are water cooled and cannot be operated while not under water. Please do not turn on your breakers or any switches prior to our starting your full pool. The plaster crew normally will actually install the lights into the wall, so don't be worried if you see a light on your pools bottom with the cord hanging loose. Your coping normally covers the bond beam and if designed, planter facings and step risers. It varies in thickness from 1"- 3" depending on the type used. 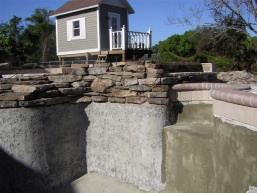 Any rockwork, stacked stone or boulder features surrounding the pool perimeter will be set, installed and grouted prior to coping and tile. Directly below the Coping and Rockwork, is your 6" waterline tile. A grout color consistent with both the coping and tile will be selected which best fits the blend and color selections. Your pool's water level should be maintained at the middle of this tile line. If you have chosen accent tile for your pool, it will often be applied just before plaster or pebble finish. Tile trim is normally put on steps and benches to denote edges and give dimension, however, deco-tiles and mosaics are typically placed at the customer’s discretion within the waterline tile, in risers or at various locations in the pools’ lateral surfaces or decking. The customer should give careful thought and mark the location of mosaics and deco tiles long before the shell is shot, so either the tile subcontractor or finish specialist will know where to place these items. The best case is for the customer to be present while the finishing crew is applying the finish. 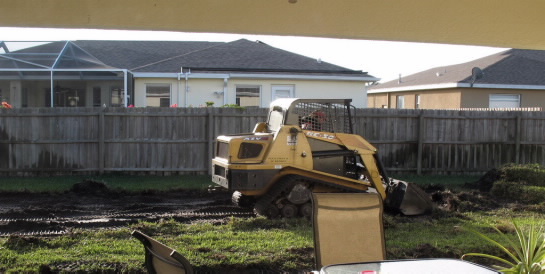 This phase will restore your projects “vision”, because up until now, your backyard has been a war zone of open trenches, exposed piping and conduit, exposed re-bar stakes, piles of dirt here and there waiting to be leveled and a big hole in the ground that was difficult to navigate. This phase will often entail digging dirt out or bringing sand or dirt in to achieve the finished elevation. Suddenly you have a pool to look at and the yard gets put back to some semblance of normalcy. Checkpoint 4: At this time it is good to review your Deck Layout. Does the design as you depicted in the original plan meet your expectations of where you want furniture, landscaping and walkways? Now is the time to ask questions. If you desire changes to your contracted layout, now is the time to advise your construction supervisor. Your decking phase begins with forming. After your deck has been brought to the correct grade, piers, risers, retaining walls or footers will be added at this time. Your plumbing pipes are kept under pressure during this forming to insure that there are no leaks later under the deck. There are numerous types of deck materials. You have obviously worked with your designer to get your preferred deck that fits into your pool budget. The thickness of your deck will vary from 4" to 6". If you have chosen a topping type deck (Flagstone, Acrylic, Stamped Concrete or Kool Deck) then a sub deck will be needed. This sub deck is made of brushed concrete. If you’ve chosen a Paver or Brick decking, 3” to 8” of compacted lime stone and/or sand fill will be installed as a base (depending on grade). If you've chosen an acrylic finish, it will be necessary to wait a few days after the sub deck is poured and then treat the surface. After treatment the crew will return to add color to your deck. A good 24 hours should be allotted before walking on any acrylic surface whether it is at the finish or color phase of installation. 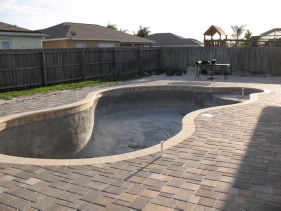 Paver and brick decks should be sealed 4 to 6 months after the pool is completed. Cool Water Pools & Spas will be available to seal your paver deck, at this time, if contracted to do so. We will do whatever is necessary to drain your deck of any rainwater. We are not responsible for drainage problems in your yard away from your decking but will address these problems at the time of decking for an additional cost if you bring them to our attention. Your designer may have already worked with you on correcting any problems. We will perform a final cleanup prior to plaster. All form boards, tile and coping debris, excess concrete, dirt, sod, etc. will be hauled away at that time. We will also fill in any ruts left by the construction crews and final grade around your decking. Sod and shrub replacement is the responsibility of the customer unless otherwise contracted for up front. The degree of restoration is already determined by you and your designer as discussed at your preconstruction meeting. 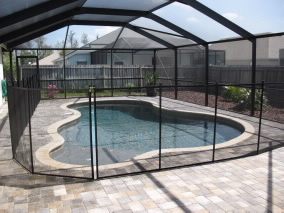 Your screen enclosure and pool “safety” fencing will typically be installed prior to plaster and pool filling. This is for safety and to protect the plaster or Pebble-TEC surface following application. If Door Alarms are required by code they will be installed at this time. 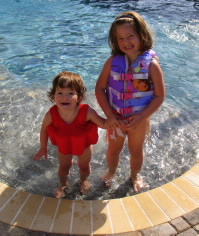 Your plaster, Marcite, Quartz or Pebble-TecÒ coating is actually what seals the pool, allowing it to retain water. We will not be able to plaster your pool if it is "weeping" water. We will notify you immediately if this is the case. If you have chosen colored plaster there are going to be streaks and imperfections. It is inherent in the color process and cannot be avoided. 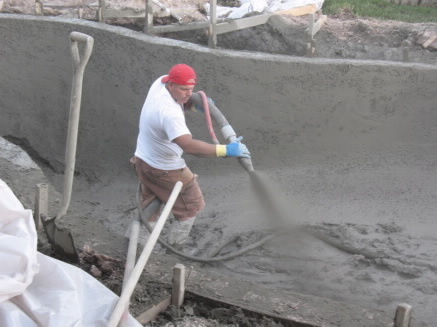 Once your pool is plastered we will immediately put a hose in the pool (with a rag attached) to begin filling your pool. Do not turn the water off for any reason until your pool's water level reaches the middle of your pool tile! This will void the finish warranty and leave waterline marks below the tile line. Once your pool is filled you should begin brushing it down at least once a day. We will provide you with a pole and brush. 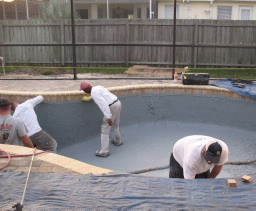 Brushing the pool down will make your pool's plaster surface smoother, so you should concentrate on the areas that you will walk on, sit on, etc. After your pool is filled with water to the middle of the tile line, call us and we'll come out and start up your pool. A pool start up consists of cutting out your skimmer loops (used to pressurize your plumbing), installing directional inlets, turning on your pump (to begin circulation), bleeding your gas line (if required), adding start up chemicals to your pool, and testing all aspects of the pool. Start-up personnel will drop off a pole and brush at this time so that you may begin brushing your pool. They will not normally install your pool cleaner because it may damage the new plaster. Read the instructions carefully on your specific model of pool cleaner before use. At Start-up we teach you how to maintain and operate your pool. It is a good idea to video tape this process. You will be given a “Complete Pool Guide” including warranty information and an advisement sheet on maintaining appropriate chemical balances. It is critical that the pool owner understand pool chemistry to a degree, as an imbalance in chemicals & Ph may cause discoloration and/or pitting to the pools interior finish (voiding the warranty). 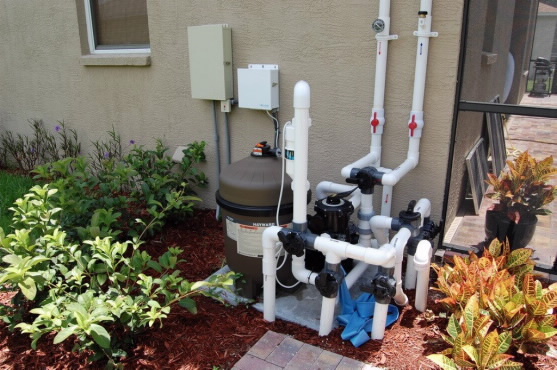 We will mark your pipes so that you know how your particular pool operates. Just remember that pipes are either on the suction or return side. Just imagine a large circle with your pump and filter at the center. 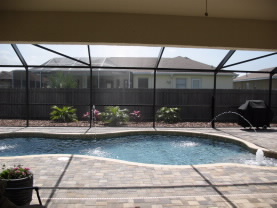 We normally wait a few days after your pool's start up before we schedule instruction. This allows your pool's water to stabilize so we can teach you how to balance your water. Step 20. Jump In And Enjoy!